The Federal Reserve: What Is The Fed? The Federal Reserve System is the central bank of the United States. It’s composed of three key entities, including a Board of Governors, 12 Federal Reserve Banks and the Federal Open Market Committee. Source: The Federal Reserve System. 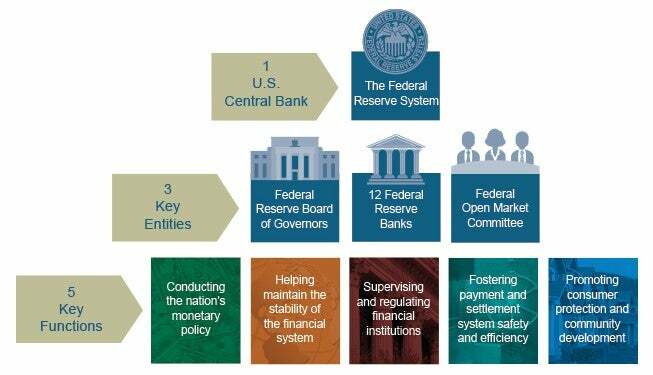 The 12 Federal Reserve Banks act as the operating arms of the Federal Reserve System. They are named after the locations of their headquarters: Atlanta, Boston, Chicago, Cleveland, Dallas, Kansas City, Minneapolis, New York, Philadelphia, Richmond, San Francisco and St. Louis. 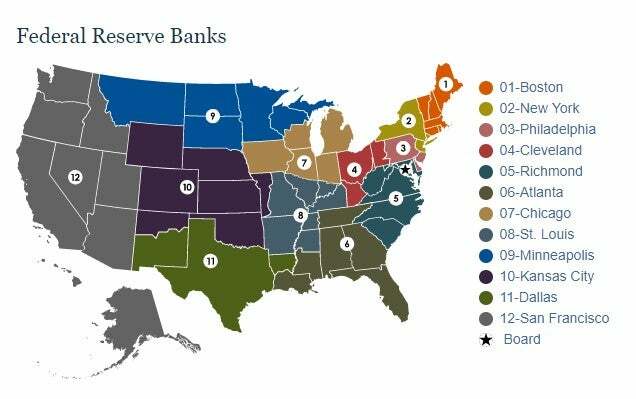 Each bank serves a specific district, as shown in the following map. These banks operate independently, but under the supervision of the Board of Governors. Each of the 12 Reserve Banks is separately incorporated and has a board of directors that consists of nine members. Each bank president contributes to the monetary policy discussion by serving on the Federal Open Market Committee. Supervising and examining state member banks. Lending to depository institutions to ensure liquidity in the financial system. Providing key financial services and serving as a bank for the U.S. Treasury. Examining certain financial institutions to ensure and enforce compliance with consumer protection and fair lending laws. The Reserve Banks are considered quasi-governmental – or “legally private but functionally public” – because they are “owned” by commercial banks in their region (e.g., banks that hold stock in their Federal Reserve Bank), but serve public goals. An important distinction to make is that, while these member banks are considered “owners” of the Fed, they don’t have many of the usual rights of stockholders. Member banks, for example, are required to hold 6% of their capital as stock in their Reserve Bank – but, by law, their dividend return on this investment is fixed at 6%. About 34% of the commercial banks in the U.S. are members of the Federal Reserve System. All nationally chartered banks are required to be members, and state-chartered banks may choose to do so. The Reserve Banks aren’t directly supported by tax dollars. Instead, they are primarily financed by interest earned on the Fed’s portfolio of income-producing government securities, plus interest on loans to depository institutions. Any excess earnings must be transferred to the U.S. Treasury. During 2008, for example, the income of the Reserve Banks amounted to about $35.5 billion, of which $31.7 billion – or 89% – was transferred to the U.S. Treasury. The System also includes the Federal Open Market Committee, better known as the FOMC. This is the policy-making branch of the Federal Reserve. Traditionally, the chair of the Board is also selected to serve as the chair of the FOMC. The voting members of the FOMC are the seven members of the Board of Governors, the president of the Federal Reserve Bank of New York and the presidents of four other Reserve Banks who serve on a one-year rotating basis. All Reserve Bank presidents participate in FOMC policy discussions whether they are voting members or not. The FOMC is the part of the Fed that makes the important decisions on interest rates and other monetary policies – which is why they get the most attention in the media. These 12 regional banks are involved with four general tasks: formulate monetary policy, supervise financial institutions, facilitate government policy and provide payment services. The chairman of the Federal Reserve oversees the U.S. banking system. Find out how this institution has stabilized the U.S. economy during economic downturn. The Federal Reserve can impact the cost of funds for banks and consequently for mortgage borrowers when maintaining economic stability. Will the Federal Reserve Hike Rates in April? Here's a look at what the Federal Reserve will or won't do in April and why.